There's perhaps no better way to discover Paris than through its food. Whether it's the smell of a freshly baked croissant, the delicate bite of a melt-in-your-mouth macaron, or even the comforting warmth of a classic French onion soup topped with creamy gruyere cheese, cuisine in the capital will always impress. From delicious street food to traditional cheese and wine shops, we've rounded up the best places to eat in Paris. Can't wait to get your hands on some classic Parisian food? Browse our last minute deals and eat your way around the city on a European day trip. If you're visiting on a romantic couples holiday, a picnic by the Siene makes for a perfect pit-stop when exploring the city. You don't need to dine in delectable bistros to impress your partner either, there's an abundance of cheap places to eat in Paris where you can grab fantastic food while on the go. Visit bustling markets and street-food stalls dotted across the city, or head to a traditional cheese and wine store - perfect for a lunch date by the river. And since there's over 350 varieties of cheese in France, you'll have plenty of choice! While the war for Michelin Stars heats up among top Parisian chefs, it's on the streets that you'll discover food that warms the cockles of your heart. Rue des Rosiers in the heart of the Jewish Quarter is heaven for street-food fans, with the end of the cobbled lane lined with pop-up restaurants selling falafel and sandwiches - L'As du Falafel being the most famous. 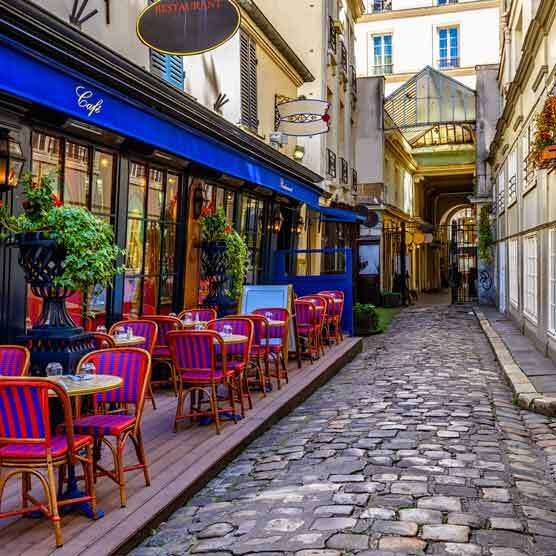 Head to Rue du Faubourg, one of the most culturally diverse streets in Paris, for a medley of cuisines including Asian, Turkish and Indian influences. Foodies must head to Street Food Party every Friday and Saturday, where the best food trucks in Paris gather in Rue Jean-Jacques Rousseau for fantastic food followed by an evening of dancing. La Droguerie: For the yummiest crepes in town - Nutella and banana overload, anyone? It doesn't get much more Parisian than taking an hour out of your day to sit in one of the city's sidewalk cafés with an expresso and Croque Monsieur. Watch the world go by as you sit where many of the city's famous artists and writers once sat, enjoying a moment of indulgence away from the hustle and bustle. Whether you choose a sunny terrace or want to warm up by a cosy fire, there are hundreds of places to escape to that offer a taste of tradition. We've highlighted some of the best cafés in Paris, so you can take a moment to unwind during your exciting city break.